I would like to share a little with you all today about Reiki! One thing some of you may not know about me… for those of you who have been following my blog… is that I am a level 2 Reiki practitioner. I love it! Reiki has brought about many positive changes in my life, and I have had the wonderful opportunity to bring some healing to others, both human and animal. I had my doubts at first, being raised in a very religious home and being taught to shun or look down on pretty much anything “in the world” that wasn’t explicitly listed in a holy book… I was hesitant to study Reiki. It was different and foreign to me, so I didn’t know if I could trust it. There are a lot of things that I have missed out in life because of a strict belief system, or because of being fearful it might be “evil”… and wanting to please those I cared about… but the past 14 months has been a time of finding myself and renewing interests that once I used to love, but out of fear that I might somehow be sinning, I had let them slip away. I didn’t realize that in the process… it was my own self that was slipping away. I was losing the essence of me… becoming someone I didn’t even know anymore, someone who was not full of compassion as I had once been, but more concerned with judgment and those things that go along with that. I am grateful for this time of rediscovery… getting to know this brown eyed girl again for who she really is inside… not what everyone else wanted her to be… but who she was born to be. And it has been a time of letting go of fears… and making new and wonderful discoveries. Life is to be lived, not feared. It is for sharing love and happiness … not looking down on anything that is different than you, or fearing it. Or making others feel less than they are, because you believe differently. Back to my topic! Sorry about that… lol. During this time of rediscovery… I found something wonderful. I actually found Reiki a couple years ago… but due to my belief system I never went further with it. Now, though, it seemed like the point to get back to studying it… my heart was hooked… and I received my first attunement. Shortly afterwards I received my second attunement. It is amazing to me… each time I lay my hands on my little girl’s head to relieve her of a headache or fever… send a distant attunement to a friend for their pain relief… help my sick dog to get well… or lay my hands on myself when I burn myself cooking! LOL (which happens frequently). There are so many instances that it has been such a beneficial, amazing thing to have. And it is not me…. it is the Reiki that flows through me. I have noticed that when I lay my hands on someone for healing, or send a distant treatment… I can feel such a hotness in my hands. It’s not unpleasant, but it is very noticeable. I can feel a warmth and a pulsation that doesn’t stop until I am done. Reiki is healing energy… Rei is Japanese for Universal …. ki means spirit, energy or life force. It was developed (re-discovered) by Dr. Mikao Usui, a theologist… the short version I will use here, is that he was searching for a healing modality that could be used to help others. To me, this means it is the closest you can get to God energy… the very energy that makes us live… breathe… the spirit that animates our bodies. This is the healing power of the universe. Many believe it is akin to the Holy Spirit… and perhaps even the way Jesus himself healed. I believe this is entirely possible. Reiki is not massage. It is a technique that encourages relaxation, stress reduction… and allows healing energy to flow into the body, helping it to heal. It is not magic. Sometimes it is instantaneous, but most of the time it takes a little time. It has even been used in chronic conditions to help people, over a number of treatments. Reiki is even being used in some hospitals and by some doctors and nurses! The higher level of Reiki you are, and the more you use and work with it, the more healing energy you are able to use and share with others. Reiki practitioners lay their hands on the person or animal that needs healing and the Reiki energy flows to wherever it is needed. Reiki is not just about physical healing… it includes emotional healing as well. It is not even something you have to believe in, or have faith in… it just is. And it works. A person receives the ability to use Reiki by an attunement. It is simple and easy to do, and doesn’t require any special college degree or years of training. From the moment you receive your first attunement, you are able to use Reiki for self healing and healing of others. Typically the first level of Reiki is used to self heal and the additional, higher levels are for Reiki work as a practitioner. Usui Reiki consists of three levels with the Master level allowing you to teach and attune others to Reiki. When we talk about attunements, you can think of it as tuning a radio to a certain station. Perhaps you can hear a faint bit of music… or it blends into another station… just a little turn of the knob and you hear the music in full! It is very similar with an attunement. Everyone has the ability to use Reiki…. It is as natural as breathing! Remember… it is the universal life energy. What could be more natural? An attunement simply tunes the receiver (the one desiring to learn Reiki) into the right “frequency” to enable healing to flow through our hands, and in some cases also our feet and eyes, as some are able to do. Level 2 and up Reiki practitioners are able to perform distant healings and attunements as well. Some use symbols and some do not. There is no distance in spirit. Reiki is not harsh, painful, evil, or scary. It is a gentle, pure and loving energy. It cannot harm you or those you lay hands on… it is only good. There are hand positions that you use… each hand position is held for three to five minutes. Reiki will go where it needs to but my personal belief is that the reason for the hand positions is A) we are able to focus the Reiki directly onto major areas of the body and B) it would be very uncomfortable to hold your hands in the same position for 30 or 60 minutes! A typical Reiki treatment can last from a half hour to an hour, depending on how long the hand positions are held and whether or not you feel led to work on other parts of the body besides just the basic positions. I also think that since the more you work with Reiki, the more healing energy flows through you… that when we put our hands on specific areas of the body, it enables the Reiki to get there more quickly and directly. Imagine if you are a new practitioner and not yet accustomed to the flow of energy through your hands… maybe you only get a very small stream at first. It would make sense to lay your hands where the pain was, or at least a few inches above, so that the energy would get there in a more direct and timely way. But that is just my opinion. When you go for a Reiki treatment, all clothes stay on. The Reiki practitioner may lay their hands directly on you (head, neck, shoulders, etc) or they may keep their hands a few inches above you, especially when it comes to other areas of the body. There is to be respect and proper distance maintained at all times. You will likely hear soft, meditative music playing, and you will be made to feel comfortable, in a relaxing environment. If Reiki is something you are interested in, I highly suggest some good books and further research. You can find a lot of good info on google too. My favorite book, though I have many, is Reiki, A Comprehensive Guide, by Pamela Miles. If you could only read one book… this would be it. Another one of my favorites is Reiki for Life: The Complete Guide to Reiki Practice for Levels 1, 2 and 3 by Penelope Quest. A third one is Living a Life of Reiki, by Shalandra Abbey. One that I have not read yet but plan to is Reiki Nurse: My Life as a Nurse and How Reiki Changed It by Meredith Kendall. I would highly suggest any of these books to someone seriously interested in learning about Reiki, whether for attunement or just personal study. If you are in need of a reiki treatment, or would like to try it for yourself, please feel free to email me at freespirit.amy@gmail.com, and I would be more than happy to help you. Tracking bracelets due to flu… what??? Incidentally, these are RFID chip bracelets that we are discussing. Interestingly H1N1 hadn’t occurred yet when this article was written in November of 2008 (at least as far as the general public knows). Even more interesting is the fact this system was bought back in 2006 and was intended for catastrophe use… fires, floods, etc. When people arrive for their shots, they will get an ID bracelet with a barcode. Next, basic information -name, age, gender, address – will be entered into the patient tracking database. There will be electronic records, too, of who gave the vaccine and whether it was injected into the right arm or the left, and time-stamped for that day. Ultimately, city health authorities said, they envision creating a network across the city that would allow public and private providers of flu shots to add data to a registry. Those in the latter group, feel free to share this info with your loved ones. Those in the first group… well, don’t worry your head about it. I woke up this morning with this word in my heart, hearing it in my mind. And what a beautiful word it is! Translated it means “The light within me honors the light within you.” It is a beautiful expression of respect. If we all honored each other in this way… realized that we each have a little spark of God in us, I believe that is where our spirits are from!… what a world of difference it could make in how we treat each other… in how we treat all life. If we see the Master, God, in all we do… everyone we speak to… every form of life… and realize it is not ours to do with as we will, but to honor, respect, nurture, appreciate, and love in a kind and honorable way… it would change us from the inside out. Every problem in this world can be brought to this in its simplicity… a lack of respect. Lack of respect for creation… lack of respect for human beings, our brothers and sisters regardless of color, race, gender, ethnicity, religion… lack of respect for the precious little animals that go about their daily routines… lack of respect for this beautiful world that God has allowed us to live on… lack of respect for all life. Lack of respect for God. We must learn to respect life… not look down on anything, any creature, any one… just because they do not agree with us or have the same beliefs. We are not less than a person just because we have different ideas. We should not treat others as less than a person because they dress differently or look differently or sound differently. We are each unique individuals, handcrafted by God and animated with God’s own breath of life, the spirit he has given us. We have our own thoughts, memories, experiences, that make us who we are. Yes, I am different from you. You are different from me. I hope so!! Otherwise there’s a cookie cutter here somewhere… and that’s not something I ever want to be. A cookie cutter person. I am me. And God loves me, and you too. 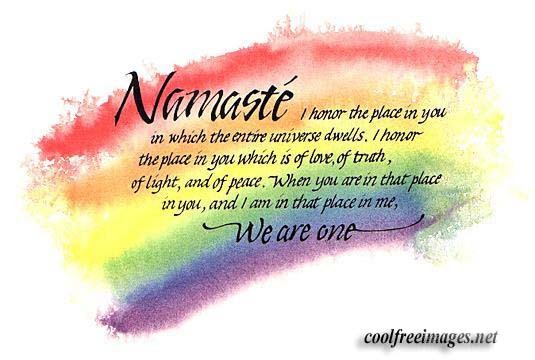 This beautiful word… Namaste… brings to mind the serenity and simplicity, of simply saying that the little spark of God in me, honors the little spark of God in you. What a beautiful way to view life. For all you moms who feel like life is passing you by… you wake up one morning and say “Gosh… am I __ (fill in the year) already? What have I got to show for my life?” … the following poem is for you. I lost my mom earlier this year, I wish so much that I could tell her one more time how much I love her… how much I appreciated all she did for me, taught me, blessed me with. But I have to trust that somehow she knows already. This is the first Mother’s Day without her… I miss her so much. I too am a mom… and I would not trade this wonderful, humbling, joyous task for anything. Not for all the money in the world, not for all the wisdom in the universe. My child is a gift that God has entrusted to me… a little soul… a precious life… that somehow, God felt, I was capable of caring for, nurturing, growing, and loving. I do not take that position lightly. It is my service to her, and my heavenly Father… it is my mission. And… I am grateful for it. For her. My little 9 year old girl that turned my world upside down and topsy turvy in the most wonderful and happy ways. :) Her smile lights up my soul like the sun itself. For those of you who are moms… for those of you that are blessed and fortunate enough to still have your moms with you… don’t waste a moment. Hug your kids… tell them how much they brighten your day, your life. They need to hear that. Tell your mom how much she has given you… thank her for all the times she didn’t let you do what you wanted. ;) Even if you had, or have, a rocky relationship with her… you’re alive, and she is the reason for that. Thank her, and even if you have to be the first to initiate it… make amends. Live each day to the fullest and happiest that you can. I did not write the following poem. It is written by Roy Lessin, a very gifted and talented, Godly writer. I hope that it blesses you, and please share it with the ladies in your life this Mother’s Day…and every day. A woman once fretted over the usefulness of her life. in her husband and children would make a difference. seemed to go unnoticed and unappreciated. “Is it worth it?” she often wondered. the still small voice of her heavenly Father speak to her heart. that is what I have called you to be. Much of what you do is hidden from the public eye. Most of what you give is done without remuneration. But I am your reward. I have called him to be without your support. and more powerful than you will ever know. I bless him through your service and honor him through your love. Your children are precious to Me. Even more precious than they are to you. I have entrusted them to your care to raise them for Me. What you invest in them is an offering to Me. You may never be in the public spotlight. But your obedience shines as a bright light before Me. Remember you are My servant.